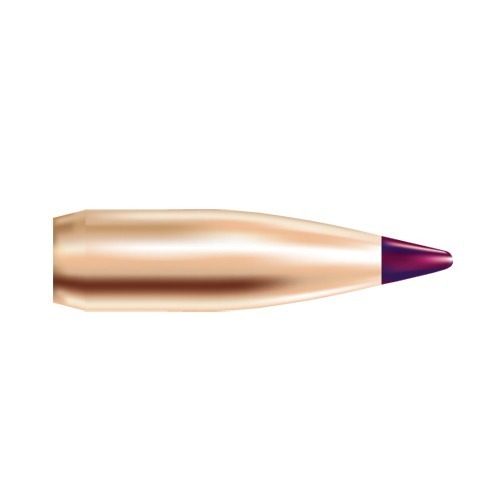 Nosler Ballistic Tip Bullets combine the accuracy of a hollow point match bullet with the game taking performance of a Solid Base hunting bullets. The tough polycarbonate tip provides an extremely pointed nose for a higher ballistic coefficient, but it also serves to initiate expansion upon impact and protects against bullet tops damage during recoil in magazine fed rifles. 100 count box. Balas de punta balístico Nosler combinan la precisión de una bala de punta hueca match con el juego tomando el rendimiento de un balas de caza de Base sólida. La punta resistente policarbonato proporciona una nariz muy acentuada para un mayor coeficiente balístico, pero también sirve para iniciar expansión tras el impacto y protege contra el daño de las tapas de bala durante el retroceso en revista fusiles alimentados. caja 100. This is a outstanding bullet! Great proformance on parrie dog and coyote. It is accurate enough to take a parrie dog 450yds and devestating on a coyote at any rang. I deffinitly recomend this to any body. These bullets reign supreme in my Browning A-Bolt over 45 gr. of H380. Target rifle accuracy from a light sporter. Doesn't get any better than that!! Obtained under 1/2 moa with two different rifles with 1/9" twist barrels. Absolutely solid consistent performance. Devastating on vermin and coyotes. I use them in my Custom made AR's that are built to reach out. I ring the 600 gong shot for shot as fast as you can recover and see what your shooting at. Use them for Prairie Dogs and Cyotes the dogs around here won't let you get closer than 300 yards but its no problem to set up further than that and work over a whole town of dogs. I loaded up a few test rounds with different grains of imr4064, and this bullet. With 23 grains I was putting 3 shots in the size of a quarter at 100 yards in my hand built ar15. A buddy of mine shot 4 shots touching each other in his colt ar15 at 100 yards. These bullets shot straight and true. Going to load more with same recipe and see what they will do at 200 yards. These load easy and are very accurate. I have shot them for some time from my 22-250 and even done so in 32mph winds. Even 35mph gusting winds did not keep me from placing shots at 300 yds with these. And they are great on Coyotes and even Prairie Dogs. I like these since they have such a high BC and I have used them on shots taken at 880yds and 10-15mph cross winds. They will stay with you when other bullets fail. I have shot a double on the dogs (that is 2 with one shot) and I would not have been able to do that if my bullet exploded. You can load these hot as you want. FPS wise,, As a matter of fact the faster the better in my gun. A friend swears by these in his 220 Swift. Look for them in 500 packs same Lot #s Sure they cost a little more than some bullets, But if your hunts are memorable, then it was worth that little extra. Loading 180 grain ballistic tip for 300 RSAUM using 60.5 grains of IMR 4350, Rem brass, Fed GM210 primers. Tangent ogive very accurate (sub 1/3 MOA)with .045 bullet jump in my 700 LTR 20" bull barrel. Velocity averages 2765 fps. These have never failed me! Already made two 300+ yard shots this year, results were astounding, they never took more than 2 steps. MY #1 FAVORITE BULLET FOR ALL-ROUND SHOOTING IN MY REM MODEL 721 .30-06. EXCELLENT FOR INFORMAL HUNTER BENCH-REST COMPETITION, BUT THEIR POST-IMPACT PERFORMANCE ON GAME ANIMALS IS WHAT REALLY SETS THEM APART FROM THEIR COMPETITORS. THEY ARE ALSO REASONABLY PRICED FOR WORKING FOLKS & RETIRED PERSONS LIKE ME !!!! I use this bullet in a Ruger 30-06 and loaded to the low end of the powder scale in the Nosler reloading book. Before I found this bullet I was using factory loads and missed more deer at long range than I could count. Since reloading my own using the Nosler 165 gr bt I have not missed once. This is the straightest shooting bullet made. Very accurate bullet. Shot a .021 in group @ 100 yds with Rem 700 in .300 Win. Very predictable bullet out to 400 yds so far. I reload this bullet in my 308 Winchester with a 1/10 twist punching .25 MOA. Obviously accurate; it penetrates deep then frags to create a devastating wound channel that drops the animal in its tracks. I have had only had one whitetail run about 30 yards leaving a light blood trail with a solid shoulder shot. I am a hunter and more than occaisional shooter. I found that I can get repeatable accuracy out of my AR308 with these bullets loaded. The bullet maintains its shape when chambered and rechambered in the Ar. Hunting soft points will not. Most White tails will take little more than 2 steps after a well placed round, these bullets allow me to make that shot. Use this bullet for hunting. This bullet is extremely accurate. When I do my part I can get three rounds to touch at 100yds. Hitting a three(3) inch metal disc at 250 yds was a simple task of placing the crosshairs on target at 8x power and the hits are right on. Sight in is 2.5" high at 100 yds. One shot takedowns of game: Axis Deer, Blacktail Deer, Mouflon Sheep, Feral Goats. Have been using the .270 130 gr. ballistic tips since they came out, about 30 years , shot a lot of deer and antelope with them . I use 55 grs. of IMR 4350 , Rem. 700 rifle. Excellent performance. Use this bullet in my Thompson Encore 308 cal. these balistic tips in my rifle are easy to start. I like to use balistic tips for this round to shoot deer and hog. I feel the 115 is a good start for the 25 in any cartridge. Accurate was very good and I like the way I could adjust them. i use in a win pre-64 mod 88 and a ruger m77 .245. highly accurate and easy to reload. both rifles shoot this bullet over win 760 powder and cci primers. the ruger can do three shot groups under .5 inch and the win 88 groups .35 inch at 100 yds. the shooter is the limiting factor. Recently loaded Nosler BT's in a 280 Rem.with excellent results. I have a very accurate 6mm.Rem.M-700,and tried the Nosler 95 Grn. I harvested a PA 130 # 8 point the first morning at 296 yards. Buck dropped where it stood with a single shot to the base of the neck. The BT actually passed through the opposite shoulder. Very impressive performance for a light bullet. I am currently working on the same over Hodgdon powders in an effort to reduce cold temp velocity variations. I have also used the BT with excellent results in a 25-06,I like them. I reload these for my 6mm Remington and these are the best most accurate 6mm bullets I've found yet. I get 1/2 inch groups at 200 yards. At any distance they are spot on and just destroy water filled milk jugs. I dropped a nice three point buck this year with one shot. Droped cold on the spot. This is slowly becoming the only bullet I load anymore. I will say that I've tried the 80 gr and 95gr. for me the 90gr was the best all around performer. Consistent hits on PD's at 300+ yards. Holds Sub MOA at 100 in Savage Model 12 BTCSS, 223. Excellent expansion. 60 Grn bullets, Mixed LC Brass, Remington BR 7 1/2 primers, TAC powder. Full length resize. Slug uniformity better than Sierra and Hornaday for fit and finish. Ogive more uniform. Ref Fabricante: 39521 054041395212 Balas de punta balístico Nosler combinan la precisión de una bala de punta hueca match con el juego tomando el rendimiento de un balas de caza de Base sólida. La punta resistente policarbonato proporciona una nariz muy acentuada para un mayor coeficiente balístico, pero también sirve para iniciar expansión tras el impacto y protege contra el daño de las tapas de bala durante el retroceso en revista fusiles alimentados. caja 100. Ref Fabricante: 35216 054041352161 Balas de punta balístico Nosler combinan la precisión de una bala de punta hueca match con el juego tomando el rendimiento de un balas de caza de Base sólida. La punta resistente policarbonato proporciona una nariz muy acentuada para un mayor coeficiente balístico, pero también sirve para iniciar expansión tras el impacto y protege contra el daño de las tapas de bala durante el retroceso en revista fusiles alimentados. caja 100. Ref Fabricante: 52111 054041521116 Balas de punta balístico Nosler combinan la precisión de una bala de punta hueca match con el juego tomando el rendimiento de un balas de caza de Base sólida. La punta resistente policarbonato proporciona una nariz muy acentuada para un mayor coeficiente balístico, pero también sirve para iniciar expansión tras el impacto y protege contra el daño de las tapas de bala durante el retroceso en revista fusiles alimentados. caja 100. Ref Fabricante: 39573 054041395731 Balas de punta balístico Nosler combinan la precisión de una bala de punta hueca match con el juego tomando el rendimiento de un balas de caza de Base sólida. La punta resistente policarbonato proporciona una nariz muy acentuada para un mayor coeficiente balístico, pero también sirve para iniciar expansión tras el impacto y protege contra el daño de las tapas de bala durante el retroceso en revista fusiles alimentados. caja 100.